If you look back to the 60s, 70s and 80s even, all comic books were solely based on writing. The art wasn’t that very good. My guess is that now art is taking the forefront due to peoples attention spans. And also maybe because comic books are usually intended for little kids. A little kid isn’t going to sit and read a comic that is all writing and nothing fancy to look at. He wants action, and most importantly he wants to see that action. i don’t think people tend appreciate writing to much later in life. I’m not reading these Marvel Now comics, but what is the intended audience? Could a 3rd grader read and COMPLETELY understand it? I’m okay with attention to art as long as the writing is there. And there’s writing and then writing. The former is “hey this is a cool story” which Marvel Now! has (parenthetically, hence the parentheses, I don’t think a 3rd grader could understand any of the Marvel Now! comics). The latter is the lines and lines of written items, both in dialogue and not. I think there is an idea that if the art is snazzy, it’s more likely to grab the attention of new readers who are just browsing covers. Comic book veterans aren’t going to be swayed either way by the cover and are still going to pick up the next issue of Indestuctible Hulk. 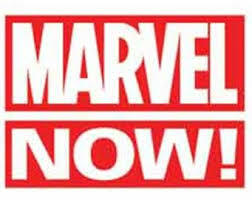 I may do another post on the Marvel Now! stuff I’ve read. Some of it is very, very good (e.g. Uncanny X-Men, Superior Spider-man, and Avengers). Some of it is not good (e.g. Thunderbolts… so much promise). And some of it I’m not sure what to think (e.g. Hawkeye). Dude, Hawkeye is AMAZING. That may be one of the very best of the Marvel NOW run. The premise of “what’s Hawkeye do on his days off” is clever & novel, the writing is light, tounge-in-cheek but excellent enough to keep your attention while the art is crisp with an excellent eye towards layouts, form & function. You’re right though: Thunderbolts did have some promise. As did Deadpool. They are both fair to fairly awful. But if you want STORY? Check out Mind MGMT, Manhattan Projects and Nowhere Men. Current. If you want esoteric weirdness, conspiracy theories and the truth on the 64-key alphabet, check out Grant Morrison’s Invisibles run. 60 issues of mind-melting strangeness. Warren Ellis’ Planetary and Alan Moore’s League of Extraordinary Gentlemen all fall in that same category. When writers can extricate themselves from the binary system of DC/Marvel, great things happen. Look at Bendis’ work on Powers (before he was brought in-house to Marvel). All of the series I mentioned above are/were published by Dark Horse, Image or prime Vertigo (which I don’t even consider to be DC). I think Marvel & DC produce what they need to produce to keep people coming back month after month. The rest can take chances, and that’s how you end up with excellent slow burns (like Hellblazer). I did not read Mind MGMT, Manhattan Projets or Nowhere Men. I have read some Invisibles, all of Extraordinary Gentlemen, and some of Planetary. Loved what I read of Powers. I also just finished the first three trades of Irredeemable (liked the premise, didn’t like the writing that much). On Hawkeye: The thing that makes me hesitant is that I really don’t think the writing is that good (Stop. STOP! Stop throwing things at me!). I think it’s kind of lazy, to be perfectly honest. Sure, the premise is delightful and refreshing, but I enjoy serials and it’s not a serial (except for getting back “the tape” which I liked). Well, I’m here to tell you that you SHOULD read Mind MGMT, Manhattan Projects AND Nowhere Men. But, if you to only pick one, Manhattan Projects all day.